Images generated in EnviroInsite can easily be published to the web and viewed in a browser. Multiple images can be added to the same file to create a comprehensive presentation. The various images can be toggled on and off by checking or unchecking the image layer in the menu. 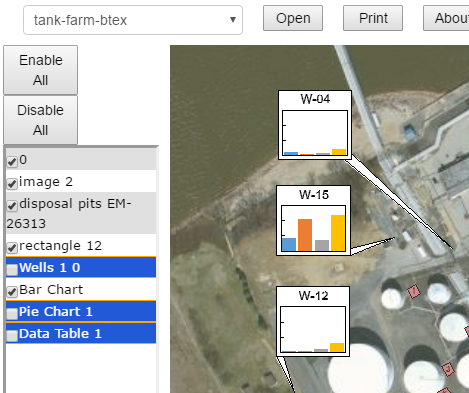 EnviroInsite takes advantage of a proprietary export script format that plots to a Canvas control on a web site. Creating the script is easy. Simply create your image, turn on the visibility of all objects, and then select File> Publish from the main menu. The Publish dialog box opens. Enter the name of a vds file. You will also need to enter the web site url, provide a user name and password to ftp the files, and a license key for the web control. This will automatically generate the vds file and ftp the file to the specified folder at your site. Lot's to do on the web site to install the control. Email support@earthsoft.com for more information on installing the web control. View details of how to publish web images here.